The tool selection here is great. 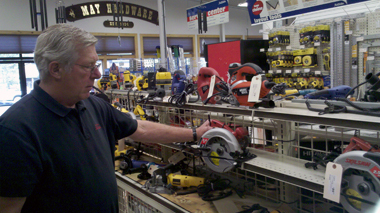 Power tools on hand are Craftsmen Milwaukee, DeWalt, Porter Cable, Skil, and Dremel. We stock Bostich, Senco and Porter Cable air nailers and nails. A full complement of carpenters bags, safety items, hammers, chisels,etc will please the handyman or contractor. Lifetime Guaranteed Craftsman tools highlight the hand tools we stock. Sockets and wrenches are available in sets or individually. Welding supplies are on hand as well as a good assortment of taps, dies and twist drills. Saw blades, drills, hole saws, specialty cutting tools and accessories are stocked, also. Arrow staplers and staples are here along with electric staplers. Of course we stock a full assortment of standard hand tools such as screwdrivers, pliers, adjustable wrenches, clamps, vise grips, measuring tools, levels, and all that stuff. The tool department is well lit and tools are displayed so as to be easy to find, so come on in and shop!